I always thought that camper shells were for old men and, now that I am 60, I guess I qualify. Oh yeah almost forgot, 10 ply tires, the ride is rough but you never get flats. Have to agree with that one. I just put 1100 miles on my truck last weekend. It's still my "go to" vehicle but I sure wish I had a resonable way to sleep in it. A simple camper shell might be the answer. Averaged about 23mpg and did do some bouncy dirt roads with no issues. Of course it's paid for which makes even better. Still not the "dream rig" but unless the stock market makes a 180, I'm going to have to stick with it. Well I think I have the perfect road trip vehicle. My Gulfstream Endura motorhome which I use to flat tow my Jeep Wrangler for those fun little side trips. That's certainly an option we've considered but one of the reasons we sold our 5th wheel is bacause it limits side trips on the way to other destination. It becomes pretty much a point a to point b deal. The 5th wheel certainly limited our options when saw something we wanted a picture of that was off the main path..
That's why we ended up with a motorhome and the one we picked. 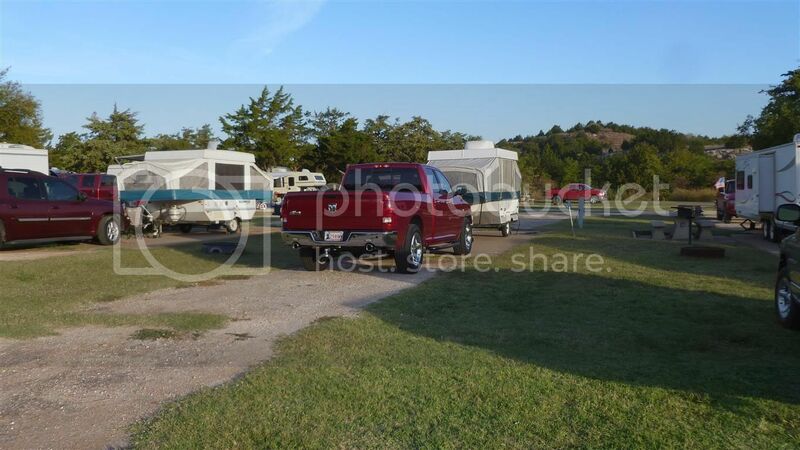 Had a travel trailer that we towed with a Grand Cherokee. Too limited and couldn't take the wrangler. I've had the motorhome down some real harry spots on some forest service roads and gravel roads to destinations. Really like it. 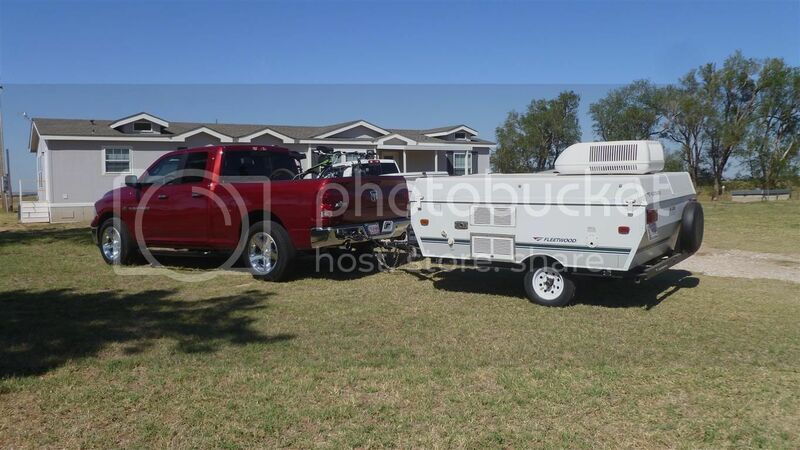 I'm looking into aluminum camper shells to put on the new 2011 F-150 Extended cab with a 6.5' bed (a 5.5' bed is too short for me to sleep in), mainly due to an aluminum top's light weight so I can more easily take it off and put it on and to optimize use of the truck when needed to haul bulk materials. My gal convinced all within range that an upgraded first impression was money in the bank, even though not needed, so we bought a new F-150. Although the 14-yr old 1998 ran fine (purchased in the fall of 1997), it needed a little maintenance which "we" didn't want to pay for. I'm impressed by all of the technology and by the price of the new truck AFTER all the rebates. Not all that much more than the 1998, all things considered. And if you are careful not to punch the wrong button it won't even talk back to you! That part takes some getting use to . . .
PS I really like the 3.5 liter twin turbo Ecoboost engine. Went with 2 wheel drive and the low speed (3.15) rear end. The truck is rated to tow almost 8,000 lbs which is more jeeps or horses than on my bucket list. Got 22 MPG right off the lot, driving back from Houston with a mild head wind. Over 200 miles driven with 300 miles estimated range left as pulling in the driveway with a 26 gallon tank. Debated the need for a limited slip rear end but with traction and stability control a limited slip rear end is no longer as necessary as it was just a few years ago. Four wheel drive is really nice when you need it, but after more than 25 years of driving trucks, just couldn't justify its initial and long-term operating costs for a truck used daily. After all Texas ain't Idaho. Somehow life is just better. Nice truck. 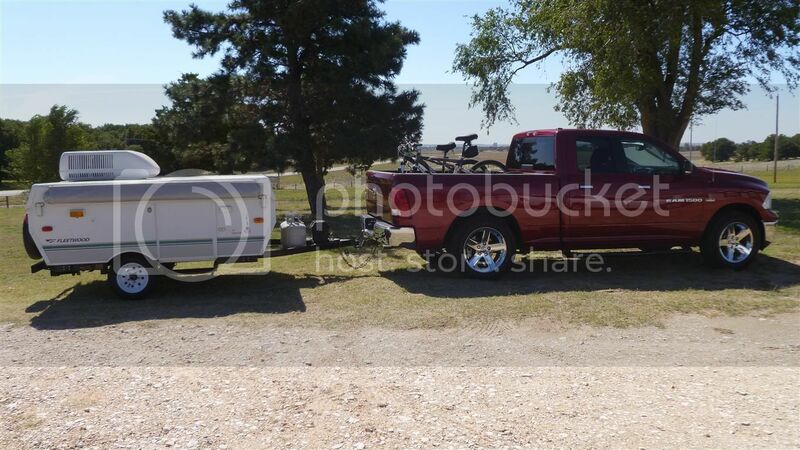 Here's my roadtrip vehicle.... my 2011 Ram 1500 pulling a 2005 Fleetwood Tucson pop up trailer. The trailer weighs less than 2000 lbs, so the impact is very low on mpg. I'm getting between 18 and 20 mpg on the hwy with the 5.7L Hemi V8. A Yakima Beddy Jo tailgate rack in back with 2 mountain bikes. Nice Darin.... Seems Shane has a nice pop up camper cult among us members here. Maybe I will follow example too. Por que no? I'll add one that I have found to work pretty good. It needs a little more ground clearance and skid plates, the traction and climbing part is fine. Back in late 07 I bought an 07 Suzuki grand vitara V6 4WD. Been a great little ride, gets between 22 and 24 mpg on the interstate at 75 mph, has a 3000lb tow rating. I think the V6 is gone for 2011 but ours has been fine. It's a full time 4WD with center locking differential for 4WD high range and 4WD low range. It doesn't run like a big V8 off the line, but has surprisingly little turbo lag and once rolling it gets up and goes. It cruises at a lower RPM than the 5 liter V8 with 90% of its peak torque (420 ft-lb) available at 1700 RPM. It's almost like a diesel but with a wider usable RPM range. It's hard not to want to step on it but it takes much less throttle to get up to highway speeds quickly when compared to the ol' 4.6 L V8. So far I'm averaging 18 mpg in mixed driving which is right at the EPA estimate. I read about people questioning the durability of the turbos but that doesn't make a whole lot of sense because the diesels that run 3 or 4 hundred thousand miles are all turbos. No regrets at this point and looking forward to many years of reliable service. I like the color of your truck and it finally hit me today. One of my co-workers has the exact same color. His is a 3/4 or 1 ton, I am not sure, but it is a Dodge. The color of that thing is amazing, it pops! Great choice. Something else hit me the other day. It is awful easy to get wrapped up in the details. But when you think about it though, most of this country was settled and up until just before WWII tamed and traveled in wagons, Model A's, Model T's and the like. Those vehicles didn't have much power and even less foot print. What they did have fanstastic ground clearance and a narrow stance. What they didn't have is the speed, comfort, and flexibility that we are looking for. Arlon, your truck looked pretty good to me. It sure beats my wimpy Silverado with the small V-8. I too feel your pain and I hope that you find the perfect vehicle for your expeditions. Homero, the gang, and me are anxiously awaiting new pictures and we want you to travel in style. QS, sounds like she was in deed the perfect road trip vehicle that stood the test of time . . . What finally killed the ol' gal? A lot of useful vehicles presented in this thread, for sure. I think 'perfect' is in the eye of the owner, and how he/she uses the vehicle. There are indeed sacrifices to pay for comfort and power; I gave up over 35 mpg in my Toyota Matrix when I traded it in. I gladly gave up 15 mpg difference to have almost triple the horsepower and torque. The commanding view of the road and quiet highway ride was another bonus (I guess you can tell I've never owned a full-sized truck). If I had the space (and could afford it), I think I would have kept the 'ol 'yota as a daily driver and use the truck for hauling. QS, Best of news: she still lives! Darin, it's just plain unAmerican not to love your truck! When all the pollution control stuff kicked in back in the '70's there was a while when the older vehicles were considered more desirable and they still are if you are into major modifications. But what the increasingly stringent pollution control and government mileage requirements ultimately did in combination with intense international competition, is increase the quality/durability by an order of magnitude. It's hard to go wrong and there is an incredible selection out there. My very humble opinion, is that for a perfect roadtrip vehicle, you can see here all the options around. Again, we are talking ROAD conditions. With this said, I am in the market for a VW Amorok Diesel Truck. I really do not want a grocery getter, i will leave that for the wife and kids. I like that this small beauty has double turbos, high torque low end rpm's and runs close to 400 miles to the tank...ridiculous, for any standards. And it is a Diesel. I have seen it on YouTube and this baby can take a beating. However, being a new truck and all it would be kind of hard to take it to the backcountry scratch it, bend it and leave some marks. Not that it would not take the pain and dish out some of it's own. But if it is to go out yonder, in to the neck of the back country and the high sierras....with out question, a built not bought rig, would be the choice for me. It takes time to find the perfect rig , for this purpose. I wish they sold that critter in the USA!